IT’S DOUBLY REMARKABLE AT CHATRIUM! Chatrium Hotels and Residences always knows how to really take care of their guests by offering a superbly satisfying stay in the very best locations in Bangkok with outstanding levels of amenities, facilities and service that truly live up to the brand’s promise of “Live the Remarkable”. 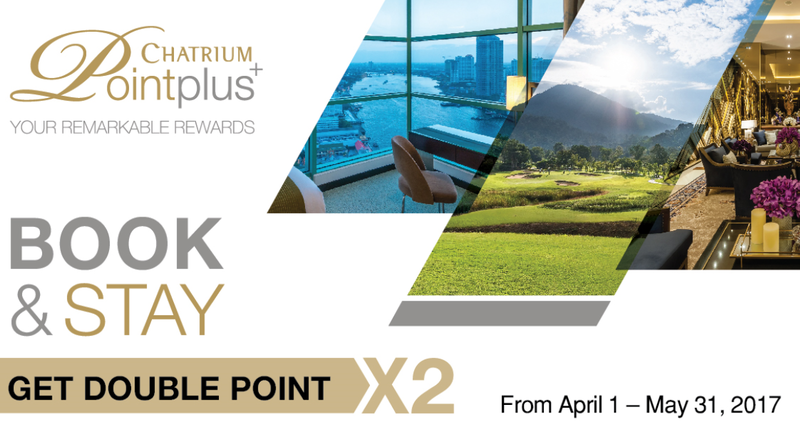 And now is the time to enjoy a doubly remarkable offer for all Chatrium Point Plus+ members to truly enhance your Chatrium Hotels and Residences experience. Chatrium Point Plus+ is a loyalty programme like no other with a host of exclusive benefits solely for the brand’s loyal guests. Simply sign up as a member and every time you stay in a Chatrium property you’ll accumulate points which can be redeemed for any number of enticing extras and discounts including complimentary room upgrades, dining, laundry, airport transfers and shopping vouchers and even complimentary stays! The sky really is the limit with Chatrium Point Plus+. And at the moment the Chatrium Point Plus+ Team would like to cordially invite you to experience double the decadence with the CPP “Double Points Campaign” where members can enjoy earning double points from April 1st to May 31st 2017 and double points during your birthday month until the end of the year! How’s that for the perfect gift? With the “Double Points Campaign” double points will be awarded for all direct bookings made via the participating hotels or at www.chatriumpointplus.com Regrettably this offer cannot be used with any special hotel promotions or events. So what are you waiting for? Indulge in a doubly remarkable offer with the Chatrium Point Plus+ “Double Points Campaign” and start earning extra points today!